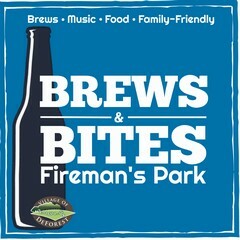 Join us for the 2nd year of the Brews & Bites series that takes place at the newly renovated Fireman's Park. Brews & Bites features an evening of live music and a variety of family friendly yard games. Along with food vendors and beverages to purchase it's the perfect setting to meet up with family, friends, & neighbors and a enjoy a summer night at the park. A reminder to bring blankets and/or chairs for seating.